Luxury villa with private pool, air conditioning, stunning view and free wi-fi. Just a 15 minutes drive from the popular resort of Carvoeiro, this modern single-storey 3 bedroom detached villa with air conditioning is set in it's own fully enclosed mature garden with private gated South-facing pool for all day sunbathing and panoramic countryside view. Inside, the pristine lounge has a comfy sofa and armchairs, air conditioning, (heating in Winter) TV/DVD player and an open log fire. There is a large selection of holiday reading with books in English, German and French, plus some games. The well-equipped and immaculately clean kitchen is fully fitted with modern units and every conceivable utensil, air conditioning/heating, electric oven, hob and extractor, dishwasher, fridge/freezer, washing machine, tumble dryer, microwave, toaster, coffee maker, etc. Dining area with extendible dining table and chairs. Free Wi-fi is provided via fast cable broadband internet. BEDROOM 1 is a double bedroom with fitted wardrobes, air conditioning/heating and en-suite shower room which is spotlessly clean. BEDROOM 2 is a twin bedroom with air conditioning/heating, overlooking the garden. BEDROOM 3 is a twin bedroom with air conditioning/heating. Bedrooms 2 and 3 share the family bathroom, all of which are, again, spotlessly clean. Air conditioning/heating is available throughout the year, at an additional charge of £120 p/w. The villa's gardens are fully enclosed. Guests frequently comment that the villa is much larger than it appears in the photos. En-suite shower room is immaculately clean, modern and fully tiled, with shower cubicle, W.C. and wash basin having illuminated mirror above and storage unit below. Pristine modern and fully tiled family shower room has shower cubicle, bidet, W.C. and wash basin with illuminated mirror above and storage unit below. Smoking is only allowed outside the property. The villa has English Freesat TV plus German, Spanish and Portuguese TV stations, free wi-fi broadband internet access and Baby equipment such Cot as High chair, and Stairgate are available on request for a small additional charge, please enquire. There is air conditioning in Summer or heating in Winter. For your convenience there is a washing machine, tumble dryer and dish washer plus all usual kitchen equipment. Maid service is included. Bed linen, bath and hand towels are provided and changed regularly and there are a selection of pool towels for guests to use. The pool is gated for child safety and there are some inflatable pool toys. There is a South-facing sun terrace for all-day sunbathing with sheltered outside seating and a barbecue.We can recommend fantastic restaurants and places of interest to visit during your holiday, as well as telling you the places to avoid! Stayed here as a family, two adults and two girls in early/mid teens. Lovely, quiet location, though less than ten minutes' easy drive to Silves where there are supermarkets, markets, restaurants and shops. The villa is comfortable, the pool is great and the neighbours friendly and helpful, if you need help. Susie is also on hand, if needed. When we return to the Algarve, we will certainly see if we can stay here again. Yet another visit and we'll be back next year. Perfect location, away from all the activity at the coastal towns, but not too far away if that's what you're looking for. We just need tranquillity, a well appointed villa, effective air con, good wifi and mobile signal, a great pool and a supermarket only a short drive away. If this is your perfect holiday, then this is the place !! Silves, under 15 mins by car, can provide bars and restaurants ... and good smart taxis to get you home !! Loved the villa, loved the area. Susie made everything so easy and straightforward. My wife and I have stayed at this villa on three occasions and next year (2017) will make it 4 times !! Over the years, we have also rented a number of other properties and this villa (together with one in Scottsdale) are our joint favourites. We wanted somewhere away from the crowds where we could just relax (as close to a 'home from home' environment as possible) and do nothing but relax, sit by the pool, eat, drink and sleep !! There are lots of things to occupy the more energetic, but for us this is our 'tranquility holiday'. 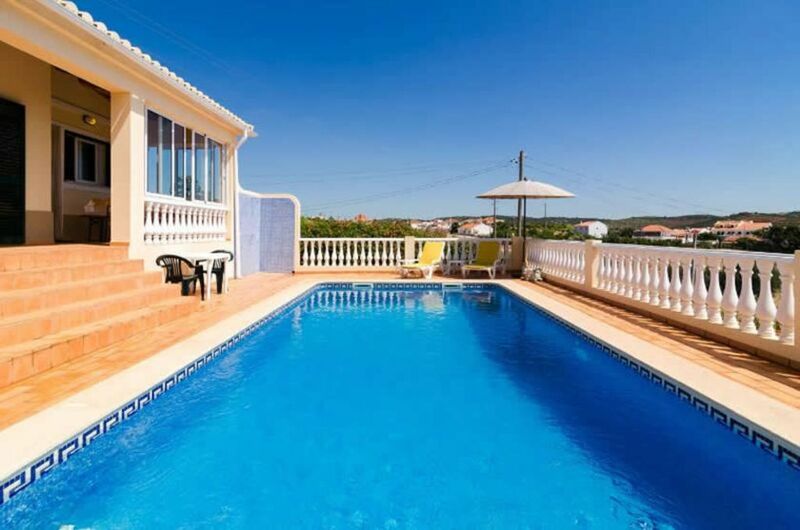 It's in a very quiet location (but not remote), has a great pool with a great view, is very close (by car) to the shops, supermarkets and restaurants in Silves and not far from the coast. Susie (the owner) is very quick in responding to texts and dealing with any 'issues'. We have only ever had one problem - when the water supply just stopped - but as Susie reassured us, this was a water main problem in a nearby lane and would soon be resolved. Mobile reception (for those renters who find this important) is excellent as is the wifi signal. The air-con system is very effective and whilst there are many places to visit in the area, as we've ticked those boxes on previous bookings, we spend most of our time at the villa. It is a very spacious villa for 2 people but still cosy and if you are looking for a 'pool holiday' - this is place to rent ! Only 15 minutes drive from the bustling resort of Carvoeiro, this luxurious villa is situated in undulating Algarve countryside and enjoys spectacular panoramic views overlooking the valley of the River Arade. The surrounding area is picturesque, the neighbours being locals who grow their own fruit and keep goats, dogs, horses and chickens. There is a coffee bar in the village and horse riding stables within walking distance nearby. Only 5 or 6 minutes drive is the town of Silves, which was once the capital city of Portugal, with it's ancient red stone castle, cathedral and architecture steeped in history, as well as an array of restaurants, bars, shops and supermarkets. Beyond that is the Monchique mountain, the highest point in the Algarve, with traditional Portuguese restaurants and fantastic views of Albufeira in the East, Portimao and the West Coast. The immense stretches of beaches at Carvoeiro, Ferragudo and Armaçao to name but a few are within 20 minutes drive with many other coves and beaches very close by as well as fabulous clifftop walks. The new Amendoeira golf course and Nick Price/David Leadbetter Pestana golf course are just 10 minutes drive away. Many other golf courses within 25 minutes drive. Two big water parks ,Slide & Splash and Aqualand are within 15 minutes drive and Zoomarine for the whole family is 20 minutes drive. Algarve Shopping Centre at Guia, just 25 minutes drive away offers great High Street shops, cinemas and restaurants, as does the Aqua Shopping Centre in Portimao. For the more adventurous the villa is ideally located for horse riding, cycling, golf, tennis, surfing bird watching or walking holidays. If you want a peaceful day or evening without the children, we have English and Portuguese babysitters who can care for and entertain your children. Silves with it's cobbled narrow streets, cathedral and ancient castle, this beautiful medieval city of narrow steeply winding streets and leafy whispering esplanades exhibits a unique and magical charm belying a rich and turbulent history. There is a public indoor heated swimming pool with gymnasium, sauna and various excercise and aerobic classes. In addition, Silves has a number of excellent shops, bars, restaurants, cafés and market. There are a selection of golf courses nearby, including the Silves Pestana course, and the famous Amendoeira Golf course which is the largest in Europe, with bowling and fitness centre among it's many facilities. Other nearby golf courses include the Pestana and Gramacho courses at Lagoa, and Morgado set in the Monchique mountain. Castle: This splendid Moorish fortress, one of the finest in Portugal, is open daily July-Aug 9:00am-8pm and Sept-June 9:00am-5:30pm, there is a small entrance fee. Cathedral (Sé): Located just below the Castle – Mon-Fri, 8:30am-6:30pm, Sun open between mass – free entrance. Igreja da Misericórdia: 16th century church opposite the Cathedral main entrance with Manueline doorway, Renaissance altarpiece and 17th century paintings. Frequently the venue for classical music evenings. Mon-Fri 9:30am-1:00pm and 2:00-5:30pm – free entrance. Archaeological Museum: Constructed around a medieval Islamic well and recently renovated and extended with translations in English. Mon-Sat 9:00am-6:00pm. Torre do Relógio (The clock tower): One of the major landmarks in Albufeira, surviving the earthquake of 1755. Ponte Grande: Impressive caverns with large arches, and also the underwater caverns of Grutas do Xorino. Albufeira Market: Takes place on the 1st and 3rd Tuesday of the month. Prices quoted are for up to 6 people per week. Air conditioning/heating is available throughout the year, at an additional charge of £140 p/w. PLEASE NOTE - We apologise, but we are unable to accept bookings of less than 7 nights. Please enquire regarding any length of stay we can offer. In the Winter period, we offer special prices for long term stays. All rentals between November and March are subject to a supplementary charge for electricity. Please note, after booking the property you will be required to complete and return booking forms and a standard terms of rental agreement. This is to protect you, the guest, as well as the property owner. You will also be required to provide passport information in advance of arrival, this is a legal requirement in Portugal.